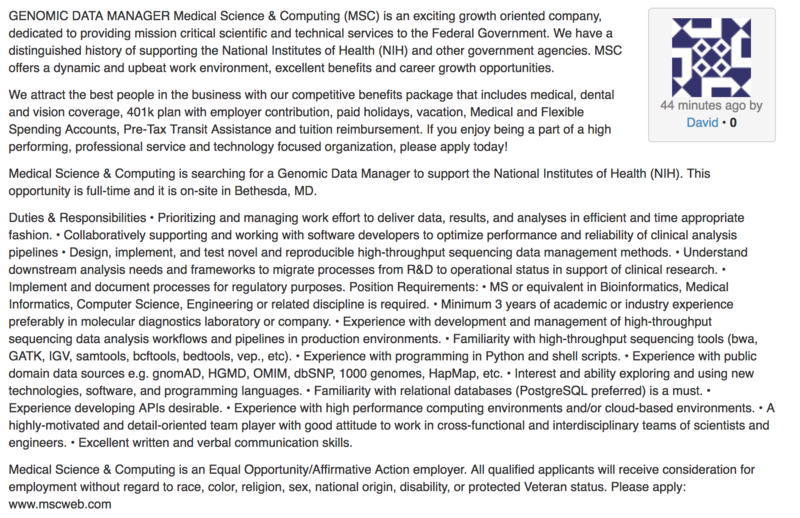 Medical Science & Computing is searching for a Genomic Data Manager to support the National Institutes of Health (NIH). This opportunity is full-time and it is on-site in Bethesda, MD. Prioritizing and managing work effort to deliver data, results, and analyses in efficient and time appropriate fashion. Design, implement, and test novel and reproducible high-throughput sequencing data management methods. Understand downstream analysis needs and frameworks to migrate processes from R&D to operational status in support of clinical research. Implement and document processes for regulatory purposes. MS or equivalent in Bioinformatics, Medical Informatics, Computer Science, Engineering or related discipline is required. Minimum 3 years of academic or industry experience preferably in molecular diagnostics laboratory or company. Experience with development and management of high-throughput sequencing data analysis workflows and pipelines in production environments. Familiarity with high-throughput sequencing tools (bwa, GATK, IGV, samtools, bcftools, bedtools, vep., etc). Experience with programming in Python and shell scripts. Experience with public domain data sources e.g. gnomAD, HGMD, OMIM, dbSNP, 1000 genomes, HapMap, etc. Interest and ability exploring and using new technologies, software, and programming languages. Familiarity with relational databases (PostgreSQL preferred) is a must. Experience with high performance computing environments and/or cloud-based environments. A highly-motivated and detail-oriented team player with good attitude to work in cross-functional and interdisciplinary teams of scientists and engineers. Please invest some time formatting the post - Copy paste from job sites does not play well with biostars, and the post currently appears as a wall of text.